and, of course, our blog-focused event coverage. Ignite Bikes takes places after the Ready to Ride Fashion Show at 4:30 in the Urban Lounge on Thursday September 23rd. 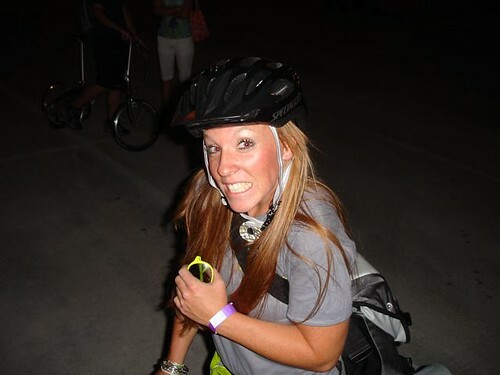 Then Meet outside the Sands Convention Center – the Bike Valet entrance – for the Mobile Social. 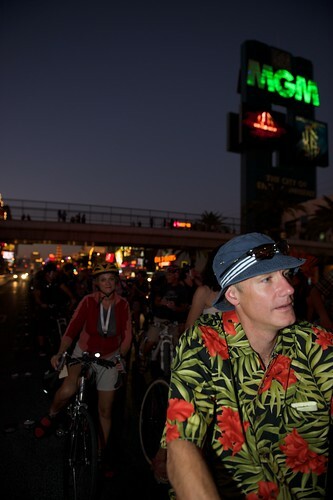 Ride the Strip with us at 6:30. Post ride we’ve got choices of Gold Sprints at Las Palmas, Here Comes the Corn at the Peppermill, and an after Fashion Show party with Kickstand Mag. What time: 4:30 for Ignite Bikes and 6:30 for Mobile Social. Not on Facebook? RSVP on Upcoming: Ignite Bikes and the Mobile Social. Our events are brought to you by partners like REI, Dahon, Puma Bikes, Metafilter, Mac Create, Textura Design. The Mobile Social is hosted this year by Kickstand Mag. 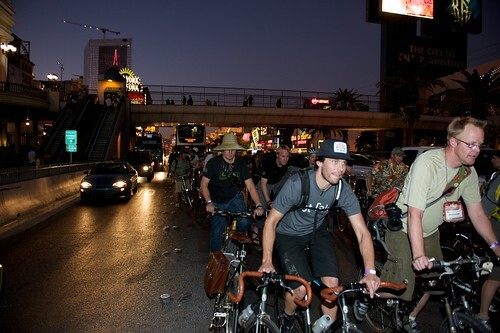 We get asked this every year: do you really ride the strip? Yes we do, with cyclists like this … she’s not going to allow no crazy cabbie to bust up into our lane. She looks at them like this while riding a Globe. It’s a good time with your colleagues.